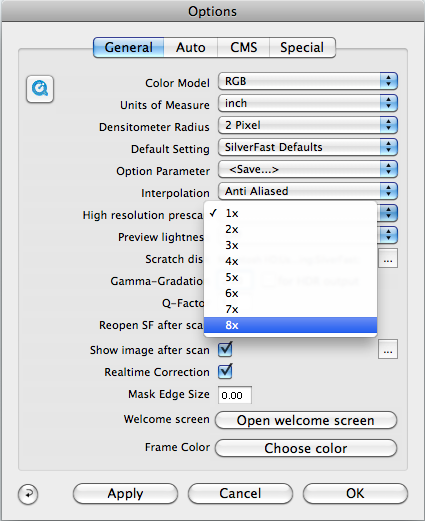 SilverFast (and most scanning applications) perform prescans in a low or very low resolution. The reason for this is to “save time”. While that is a good argument. The drawback of quick (slo-res) prescans is, that the image you are using for corrections and adjustments does not correspond 100% neither to the details of the actual image nor with the endscan. It also means the information on the histogram is not as precise as it should be. Since you are performing adjustments and corrections based on not accurate information, you might end up having to correct the outcomes later on an editing program (which also will affect the quality of the image). Some of those problems might be innacurate color reproduction, color casts, inacurate shadow and contrast results, etc. These might be elliminated by having a prescan performed with high resolution, another advantage is that if you zoom into the prescan, SilverFast will not have to perform another prescan with the details, they are already there! High resolution prescan under options dialogue. Select the general tab and under the High resolution menu select the factor by which you want to multiply the preview (as seen in the previous graphic), then click on “Apply” and “OK”. If your original material is big, a factor 3x or 4x are good enough to come close to what the image might look at the end. If your originals are small (35 mm slides and negatives) then a 6x or 8x factor might be convenient. If time goes over quality and precission the reduce the prescan option again to a factor of 1x to return to the lowest pre-scanning resolution. A great tip- thank you! Super! Just what I’m looking for BUT…. …I can’t find it in the Preferences in SilverFast 8 AI Studio. Is there such a feature in this version? yes there is such a feature in SilverFast 8. It can be found in the “General” tab of the preferences, 5th item from top. It is not in my laatest version of SF. Is that because I have a demo version. Hope it has not been removed, because I need it badly. which version is installed ? but not in the SE or SE Plus editions.